It may seem a little counterintuitive to add salt to a freshwater fish tank, but some aquarists believe that adding salt to the fish tank will benefit the fish. Not all experts believe salt in a freshwater tank a good thing, but most agree that if you do add salt, it should be the right kind of salt and for the right reasons. Salt is ubiquitous. It's in the human body, the water and the animals. Table salt, or sodium chloride, usually contains iodine, potassium and an agent to keep the salt from caking due to humidity. If you purchase non-iodized salt, you won't worry about the iodine, but the caking agent is dangerous to fish. Aquarium salt is also sodium chloride, or NaCL, but doesn't have the additives found in table salt. Marine salt is a different kind of salt altogether and should not be confused with aquarium salt. 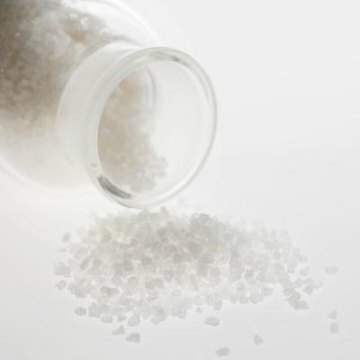 Marine salt contains buffers that will kill freshwater fish and should only be used to salinate the water in salt water tanks in preparation for fish found in the oceans. Though its use is somewhat controversial, aquarium salt is used in freshwater tanks for a variety of reasons. The presence of salt in the water inhibits algae, keeping the tank free of green slimy stuff on the glass. it does, however, promote the slimy stuff on your fish's body which boosts the fish's immune system and aids in wound healing. Salt also keeps many pathogens and fungi away, promoting fish health. A common ailment among fish is caused by the protozoa responsible for ichthyophthirius, or ich. This protozoa doesn't thrive in a salt water environment, and neither does chilodonella cyprini, a parasite that causes a disease not easily detected. You may have been advised by the staff at the pet store that it's standard practice to add salt to a freshwater tank. This is not necessarily so. If you are going to add salt to your tank, make sure you are using the right salt and doing it for the right reasons. Don't use marine salt; use aquarium, kosher or canning salt. Table salt usually contains iodine, which the fish needs but gets from the fish food. Any more iodine than that and it becomes a detriment. Salt should be used during times of stress to the fish, such as during an outbreak of a disease. But it should not necessarily be added to your tank just as a matter of routine care. The amount of salt you add to the tank is dependent upon your reason for doing so. Some fish do not do well with even a little salt in the water, so if you have a community tank with a variety of fish, you shouldn't use salt until you know for sure the species of fish you have will tolerate it well. Salt should always be completely dissolved in dechlorinated water as it can burn the fish's body should it come in contact with salt crystals. Salt inhibits the action of zeolite, a product used to eliminate ammonium and ammonia. A good rule to remember is the old saw, "If it ain't broke, don't fix it." In other words, if your tank is doing well without salt, continue to maintain a routine cleaning schedule. However, if your fish appear sick, consider using salt along with the medication you are using in the tank. Be sure, however, that you know whether all of your species tolerate salt. You may have to set up a hospital tank for sick fish to keep fish with salt intolerance separated from those who are in need of salt and medicine. Aquatics Unlimited: Salt in a Freshwater Tank? Badman's Tropical Fish: To Salt or Not to Salt? Can You Put a Sea Urchin in Freshwater? Will a Fish's Tail & Fin Regrow? Are Salt Spools Good for Guinea Pigs? Do Goldfish Need Chemicals for the Tank?